Red Lake Peak is an exceptional hike that includes on and off-trail travel. Although half of the route to Red Lake Peak is off-trail, those few miles are easy to navigate because they’re across open terrain allowing you to see for miles in all directions. And, those views are incredible! You’ll be treated to glimpses of Freel Peak, Lake Tahoe, Desolation Wilderness, and full panoramic scenes of Stevens Peak, Meiss Country (including Little Round Top and its ridge), Kirkwood, Caples Lake, The Sisters and Round Top, Elephants Back, further southeast into Alpine County, and Hope Valley and Hawkins Peak. Red Lake Peak is a favorite among local backcountry skiers as the peak is relatively easy to access and provides amazing lines off of its eastern side. Although for cross-country skiers and snowshoers, travel to Red Lake Peak but return to the trailhead along the same route you took to reach it. Click on the above map to enlarge it for better viewing and printing. This map is only for reference and shows the general route to Red Lake Peak. Always carry a traditional topographic map and compass when traveling in the backcountry. Please note the “start” and “stop” icons are reversed here. Park in one of the lots at Carson Pass in order to hike to Red Lake Peak. I recommend parking in the north lot (trailhead is located here) in order to avoid having to cross SR 88. Vehicles zip around SR 88 pretty quickly and there are some blind corners, so save yourself the hassle and just park in the north lot. Besides, there will most likely be more available parking spots in the north lot because most people who travel to Carson Pass hike south to Frog Lake or Winnemucca Lake (and park in the south lot as it is closer for those hikes). No matter the season, you will need to pay a parking fee at Carson Pass. In the summer, you can pay with cash or check using a self-pay envelope (and depositing it in the iron ranger) or pay at the Carson Pass Visitor’s Center in the south parking lot (check times for when the shop is open). For winter months (November 1-May 30) you’ll need a Sno-Park permit ($5/day, $25/season). The permits need to be purchased elsewhere, such as online or in Meyers or South Lake Tahoe. 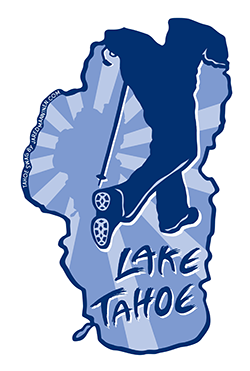 There are no options to purchase Sno-Park permits at any of the Sno-Parks around the Lake Tahoe Basin, so come prepared. Here’s a map to help you find the parking area and trailhead for hiking to Red Lake Peak. Beginning from the trailhead in the north parking lot at Carson Pass, hike north along the trail (which also happens to be the Pacific Crest Trail) for about 1.5 miles. At about this mile and a half mark you’ll find a tarn just off to the left (west) of the trail. This small mountain lake is considered to be the headwaters of the Upper Truckee River, and this location also forms the southernmost point of the Lake Tahoe Basin watershed area. Once you reach the tarn, walk a few paces further along the trail to find a small creek or draw on the right (east). Head up this draw toward the false summit (prominent outcropping of volcanic rocks). Most of the time I don’t trace a line right up the center of the ridge and hike directly up this false summit. Rather, I circumnavigate it and find a lower angle pitch to hike up it. Either way, though, you need to make your way to the top of this false summit so that you can continue hiking along its spine. Once you’ve negotiated the false summit, Red Lake Peak should be obvious. It’s the volcanic rock outcropping that looks similar to a fin and appears off-center from the giant mound above you. Follow the spine of the false summit to one of the foot paths (there are a couple options, but neither is any better or worse) leading in the direction of Red Lake Peak. Don’t feel obligated to climb up the volcanic rock outcropping that actually forms the top of Red Lake Peak. In fact, I highly discourage it as the rock is too fragile and steep for most people to climb safely. Generally, people (myself included) just hike around the base of the outcropping. I do recommend hiking around its eastern side so that you can get an unobstructed view of nearby Stevens Peak. I also recommend hiking just south of Red Lake Peak on the ridge to see some stunning views looking into Alpine County. The layers of undulating mountain ranges to the south are picturesque, to say the least. A couple more notes about traveling to Red Lake Peak … be mindful of your steps (and children) when hiking around the peak itself and its neighboring ridge as there are numerous tripping and slipping hazards adjacent to steep cliffs. Also, whenever you hike off-trail do everything in your power to minimize your impact on the land. Mostly this consists of leaving all natural features alone (i.e. don’t roll, topple, or throw rocks and other naturally occurring structural features), avoiding walking on delicate vegetation, and don’t harass or otherwise tempt (by feeding) the wildlife. For cross-country skiers and snowshoers, the route to Red Lake Peak is usually modified in some way in order to make it more direct. There’s no reason to stick to the official trail when everything is covered with snow! But you do need to know where you’re going and how to return, so don’t completely rely on the tracks laid before you. As always, carry a map and be mindful of your surroundings. Keep in mind that you don’t actually have to cross-country ski or snowshoe all the way to the top of Red Lake Peak in order to have a good time. Oftentimes, I’ll just ski out to the tarn (sometimes not even that far), find an angle of terrain appropriate for my downhill cross-country skiing skills, and have a blast taking a bunch of runs up and down the hill. For advanced backcountry travelers using alpine gear such as Randonee, Alpine Touring, Telemark, split boards, and snowboards, look elsewhere for information about backcountry skiing down Red Lake Peak. This is not my forte, and there are other websites that can provide much more accurate and relevant information.